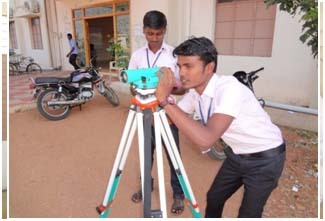 Diploma in Civil Engineering was started in the year 2010 and functioning since for the enrichment of the Civil Engineering students in various ways. Civil engineering is a professional engineering discipline that deals with the design, construction, and maintenance of the physical and naturally built environment, including works like roads, bridges, canals, dams, and buildings. So the department has been well equipped in imparting quality education to meet the technological advancement and industrial requirements. The understanding of the structure, physical and mechanical properties and behaviour of engineering materials is at the very core of engineering design. Civil Engineering survey is based on measuring the road level, and area of land, height of building, providing the road curve, contouring map, recording and drawing to scale the physical features on the surface of the earth. clients, digital media playback, and special-purpose software applications. With CAD systems, drafters can create and store drawings electronically so that they can be viewed, printed, or programmed directly into automated manufacturing systems. CAD systems also permit drafters to quickly prepare variations of a design. Although drafters use CAD extensively, it is only a tool. Drafters still need knowledge of traditional drafting techniques, in addition to CAD skills. The standard method of determining strength of hardened concrete consists of testing concrete cubes in compression. The quality of entire concrete of a structure cannot be fully assessed by testing a few concrete cubes. Construction lab becomes necessary to assess the quality and strength of concrete of the structure. This lab is used the hydraulics pressure in pipe line, input and out of pressure, efficiency of the pump, quantity of water, pipe friction factor, rectangular and triangular notch.